Brussels, Belgium: what comes to mind? Do you think of a capital city with a vibrant cultural scene? Or perhaps its thriving, innovative business community? Maybe you’re focused on its political clout—a city known for its strong connection to the European Union. This June 16-18, 2017, a group of Kogod students experienced all of this and more. Their journey—both an academic and a cultural experience—placed them in the heart of the city for a weekend of business site visits, group presentations and sightseeing. The trip marked the MBA@American program’s first international immersion, bringing online students together from across the US to explore Brussels’ business landscape. Nearly 60 MBA candidates attended, 29 of which also completed a London extension course following the end of the weekend. 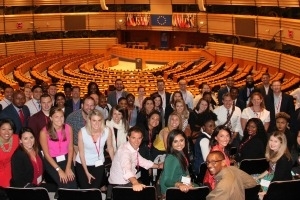 The MBA immersion kicked off with a visit to the European Parliament, seat of the European Union and hub for some of the region’s most important political debates. While touring, students learned about the EU’s decision-making process, which parties participate and how the Parliament is structured. “It was surreal to stand in the room where the Parliament actually convenes,” says Danielle Balmelle, MBA ’17. For Applewhite, the most impactful part of the visit were the presentations. Staff lectured on some of today’s hottest topics, such as Brexit and T-tip, and discussed how the EU plans to address the issues moving forward. Applewhite says the experience introduced her to new perspectives, and encouraged her to consider opinions she hadn’t thought of before. “I went in with lots of biases. Hearing local viewpoints, rather than just reading about issues from afar, was really eye-opening,” she says. The cohort also visited MindGate, a business region located in Leuven, a city about 25 kilometers east of Brussels. The trip offered MBA@American students the chance to explore the intersection of different local and international organizations, introducing them to various tech, healthcare and educational institutions. “It was fascinating to see how they’re merging all these fields to create an innovative business ecosystem within the city,” says Balmelle. Students split into groups and toured different businesses, then met with company representatives to brainstorm solutions to problems affecting their enterprises. Balmelle’s group met with Imec, a R&D healthcare technology company that produces microchips. The company’s major issue? Attracting—and keeping—talent. Her group tackled the challenge head-on, making recommendations for how Imec could better incentivize employees to work for the company. Ideas included helping spouses find jobs in the area, or finding ways to better integrate employees in the community. Students researched and analyzed their suggestions, assembling a presentation that they presented the final day of the trip. “This was important because I really learn best by doing. This experience helped bring everything together–knowledge from our online classroom, and knowledge gained on the trip,” Balmelle says. The trip, while centered on academic experiences, wasn’t all knowledge-focused. Students still found time to visit local cultural sites and explore the city. They did walking tours of Brussels, visited a Stella Artois brewing company in Louvre—even toured an authentic Belgium chocolate factory (complete with a full-spectrum tasting, of course). Experiencing a different culture was just as meaningful as visiting the European Parliament and Mindgate, says Applewhite. The trip’s extracurricular outings helped put everything into context, and showed her a different way of life. Both students agree that the Brussels immersion was an all-encompassing experience—one that was equally educational and inspirational. It exposed them to Brussel’s vibrant business landscape, and encouraged them to embrace new perspectives. The trip was a doorway of sorts—a passageway to new possibilities. Learn more about the MBA@American program and its upcoming immersions.